The Wall Street Journal reported this week that Apple and Google are forging ties with automakers to develop various vehicle technologies such as infotainment platforms and autonomous driving systems. 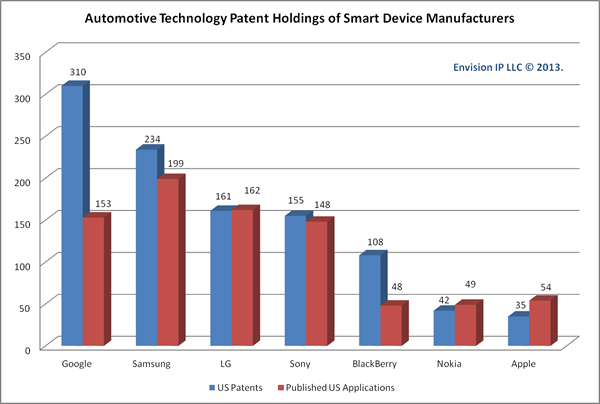 Envision IP analyzed the US patent holdings of Google, Samsung, LG, Sony, Nokia, Apple, and BlackBerry to understand which of these companies may be leading innovators in the smart vehicle and hybrid/electric vehicle space. Google owns 310 US patents and 153 published US patent applications related to smart device and vehicle integration and navigation/route guidance. A majority of these patents were obtained from Google’s acquisition of Motorola Mobility. However, Google has independently developed its own vehicle technology, with 75 US patents and 42 published US patent applications originally filed by Google. Many of these patents relate to autonomous vehicle technology. For example, see Google’s US 20130261871 entitled “Gesture-based automotive controls”, US 8,457,827 entitled “Modifying behavior of autonomous vehicle based on predicted behavior of other vehicles”, and US 8,428,873 entitled “Panoramic images within driving directions”. Samsung, through various entities such as Samsung SDI Co. Ltd., Samsung Electronics Co. Ltd., and Samsung Electro-Mechanics Co. Ltd. owns 234 US patents and 199 published US patent applications in this space, with a focus on electric vehicle and rechargeable battery technologies. For example, see Samsung’s US 8,498,764 entitled “Electric vehicle and method of controlling the same” and US 7,768,235 entitled “Battery management system and method for automotive vehicle”. LG is the third largest patent holder among the companies we analyzed, with 161 US patents and 162 published US patent applications related to navigation/route guidance, vehicle battery optimization, and electric vehicle drive and control systems. For example, see LG’s US 8,593,020 entitled “Electric motor and electric vehicle having the same” and US 8,423,281 entitled “Apparatus and method for providing travel route in navigation system”. Sony owns 155 US patents and 148 published US patent applications in this space, with a focus on navigation/route guidance systems and in-vehicle infotainment platforms, as well as vehicle hardware such as mirrors and lighting systems. For example, see Sony’s US 8,040,227 entitled “Method for detecting moving objects in a blind spot region of a vehicle and blind spot detection device” and US 7,171,026 entitled “Steering device, method of authenticating a driver, and vehicle”. In comparison, Tesla Motors owns 151 US patents and 111 published US patent applications related to various aspects of its electric vehicle technology. BlackBerry owns 108 US patents and 48 published US patent applications related to navigation technology and in-vehicle information systems. 83 of these patents and 27 of these patent applications are assigned to QNX Software Systems, which BlackBerry (then Research in Motion) acquired in 2010. For example, see BlackBerry’s US 8,385,947 entitled “System and method for communicating using an in-vehicle system” and US 8,433,505 entitled “System and method for faster detection of traffic jams”. Next, Nokia owns 42 US patents and 49 published US patent applications in this space related primarily to vehicle navigation, mapping, and in-vehicle information systems. For example, see Nokia’s US 8,504,285 entitled “Method and apparatus of route determination” and US 7,193,528 entitled “Method for outputting traffic information in a motor vehicle”. Finally, Apple owns 35 US patents and 54 published US patent applications related to mobile device and vehicle integration, as well as navigation/route guidance systems. For example, see Apple’s US 8,610,674 entitled “Programmable tactile touch screen displays and man-machine interfaces for improved vehicle instrumentation and telematics” and US 8,538,462 entitled “Synchronizing mobile and vehicle devices”. Samsung and LG’s patent holdings suggest that these Korean firms are focusing their R&D efforts on vehicle hardware, electric/hybrid engines, and battery technologies that could be implemented with existing automotive platforms, or perhaps integrated into smart vehicles wholly developed and manufactured by Samsung and LG, respectively. On the other hand, Google, Sony, Nokia, Apple, and BlackBerry’s patent portfolios in this space are more focused on in-vehicle information and multimedia systems and navigation/route guidance systems. Google also has a relatively large number of patents related to autonomous vehicle technologies, giving the company a well-rounded patent portfolio for both vehicle platform and smart vehicle integration technology.